A few years ago, while waiting on my adult daughter to finish her viola lesson at Kids Make Music, I gazed across Green Street in Morganton, at the now empty lot. My mind drifted back to the first time I was devastated by a fire in our town. Old historic houses have always called to the writer in me. I encountered one such homestead soon after we moved to Morganton in 2002. While making my way through downtown toward the post office, I saw the Perkins House for the first time. I knew immediately that this once magnificent home would one day inspire one of my stories. I intended to take photographs and do some sketches of this wonderful old house. But to my heartbreak, I opened my newspaper one morning to see nothing left but some charred stones and a pile of ashes. The owners tried to sell, but ended up donating the house to be used in a controlled burn as a training exercise for our fire department. 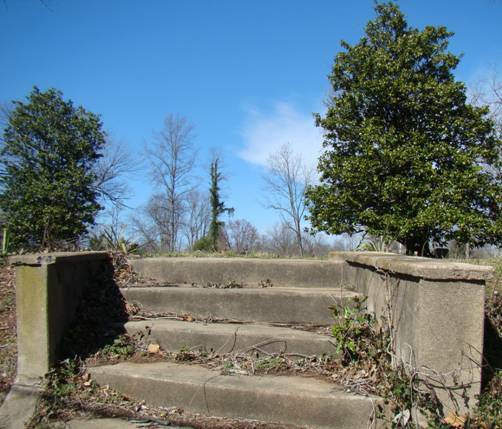 All that’s left are some stone steps leading to a vacant lot. I found the story on the News Herald Web page. It reported that WCIS, our hometown Southern Gospel station, burned to the ground in the early hours of the morning. Later they reported that the blaze was started to hide a burglary. I’d tuned into WCIS earlier that day, as usual, to listen to John and Bob on the Sunrise Show. Upon receiving static, I assumed they’d been damaged by the recent weather and would be back on the air soon. Even when the station was flooded out a few years ago, the transmitter was miraculously spared and they were up and running in a short time. Many renovations and needed updates were done after the flood and WCIS ended up in better shape than before the disaster. Now all was gone. They had to start over. My heart ached for them – and for me. Here in North Carolina, Southern Gospel stations can be picked up almost anywhere. In the Midwest, where I lived most of my life, that’s not the case. One of the greatest joys of living in Morganton has been to switch on the radio and hear my favorite music. I will never take Southern Gospel radio for granted because I know what it’s like not to have it. After the fire, many came forward offering help, and WCIS once again came out even better than before the disaster. The Whisnants, who own and operate the station, were amazed at how God worked it all out. The burglary and fire were meant for harm. But WCIS has a God-given mission, and as the Bible says in Romans 8:28, “… all things work together for good to those who love God, to them who are the called according to his purpose.” Every Spring and Fall, listeners in Burke County and the surrounding area have the opportunity to make a pledge during Share-a-Thon. This is one of the main ways we can make sure they stay on the air and continue their ministry of sharing the Gospel. The house on North Green Street, a once beloved family home, was burned to the ground. But it rises from the ashes in my writer’s mind, every time I see that vacant lot. I’m pretty sure it will live again someday in one of my stories. 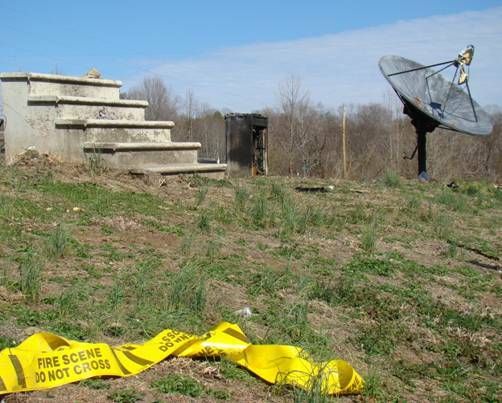 The old radio station on Bost Road, a beloved family ministry, was also burned to the ground. But it too, rose from the ashes and are broadcasting stronger than ever from their new station located on Hwy. 126. WCIS is still touching hearts and lives with the musical message of the Gospel – broadcast Southern Style.